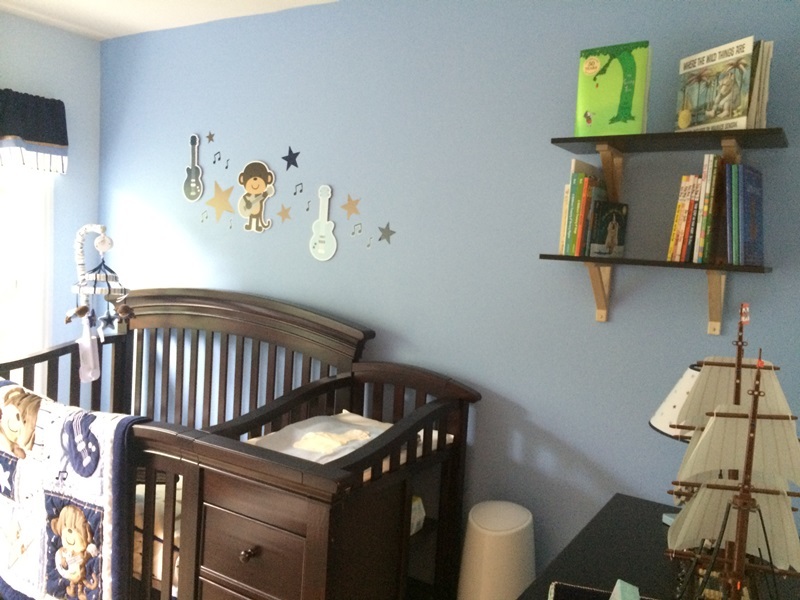 Jay & I have made even more progress on Baby G’s nursery! We still have a few things left to do, but this is pretty much the finalized look. We got the shelving from IKEA and the wall art/mobile/bedding from Babies R Us. A word of caution to anyone considering buying bedding from Babies R Us: I washed everything very, very carefully on Sunday and both blankets don’t look right anymore. The stitching on the comforter is already starting to come undone and the “fuzziness” of the blanket is gone. I want to exchange them, but I used a coupon when I bought them and I’m not sure if I’d be able to exchange it for the same price without another coupon. So, this is just a word of caution to anyone out there: Beware when buying the themed bedding from Babies R Us! Other than the actual bedding itself, I LOVE the theme. I’m not much of a decorator, so Jay took the reigns, coming up with the idea for the shelving and putting up the wall art and decals. When we first went to look for a theme back when we were adding things to the registry, I wasn’t sold on anything we saw until I saw the Rockstar Monkey theme. I love the Rockstar Monkey because the monkey plays the guitar, just like Jay plays guitar. Jay has been playing a lot of guitar to Baby G lately and he has started responding by moving a lot more while he plays, even if he was not moving at all beforehand. Hopefully we made the right call on the theme…and if not, then someday, he can tell us he hates it and we’ll change it, lol. There are a few things left to do: We need to put up a mirror above the dresser, set up the video monitor, put a few things on the wall still that we got as gifts, and get bookends for the shelf. I am considering making bookends myself, so I was a busy little Pinterest-er last night, haha. I was looking to buy guitar or music themed bookends from somewhere but everything I found was a lot more money than I wanted to spend. I may make my own using the same wooden guitar art that we put up on the wall. I haven’t totally thought it through yet, so we’ll see. 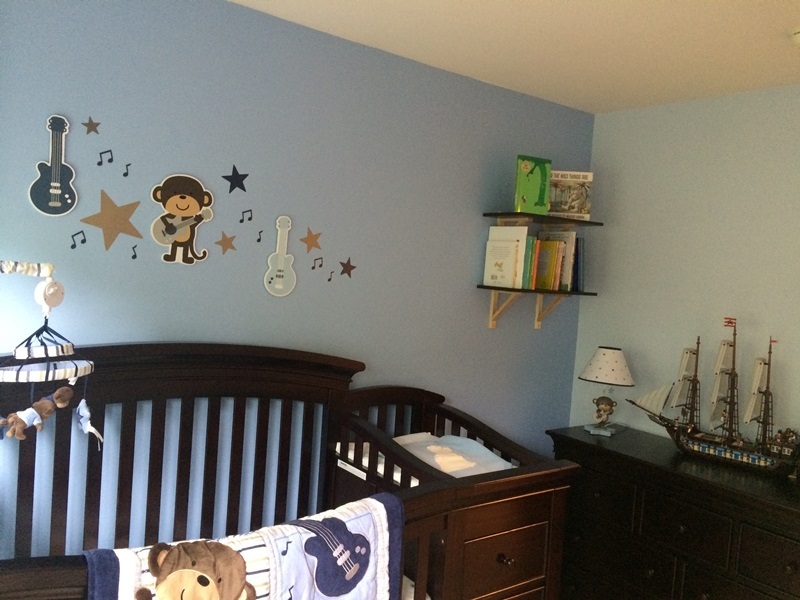 Anyway, here’s some pictures of the nursery. It feels great to pretty much have it finished. Now I just hope that Baby G gets here sooner rather than later. Come on, baby! Since this picture was taken, a mini San Diego Chargers helmet was added to the bottom shelf, in the space in between the books. 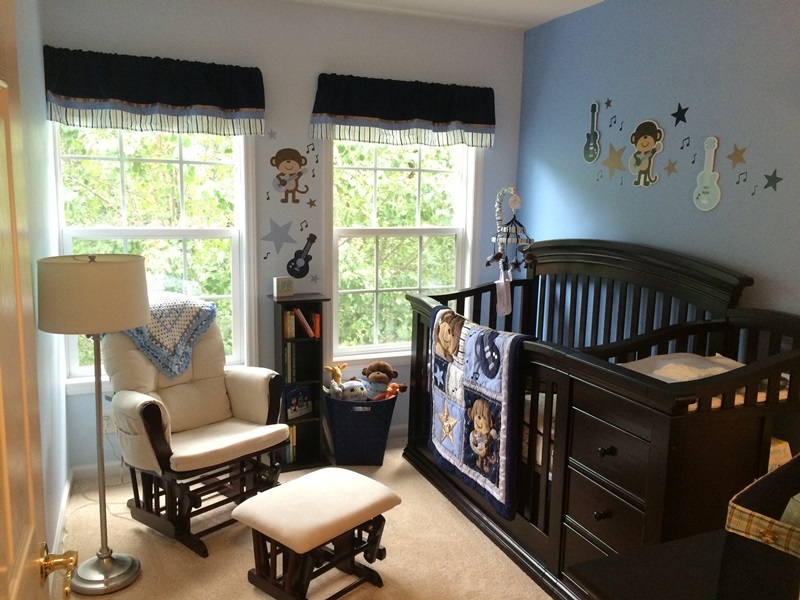 This entry was posted in Baby and tagged Babies R Us, baby nursery, Guitars, Monkeys, Nursery, Rockstar Monkey. Bookmark the permalink.